Pulsair Systems build powerful, heavy duty energy efficient mixing systems to mix large crude oil storage tanks. The mixing process works by pulsing large bursts of compressed air/gas through a series of flat round plated welded to the tank floor. The energy from each pulse is released laterally across the tank floor to stir up and agitate settled solids and sludge in the tank and bring this material to the surface. The process is more efficient than side entry mixer because the Pulsair mixing process starts immediately on the tank floor and lifts and pushes the heavier solids to the surface rather than push liquid laterally across the tank floor. The Pulsair mixing process has been proven to efficiently and effectively mix large diameter (100 foot plus, 3-million gallon) No. 6 oil (rediual fuel oil) or RFO on Staten Island, NY. (see above). Once the accumulator plates are attached to the tank floor and air/gas delivery pipes are plumbed in properly, there is no more in-tank maintenance. The operate can then mix at any liquid level. 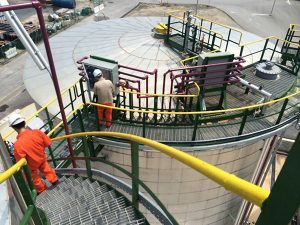 This efficient crude oil storage tank mixing process significantly reduces and/or can eliminate periodic and expensive crude oil storage tank cleaning. This large oil tank mixing process can work on heavy black oils, waxy oils and heavy bitumen products. By adequately keep the crude oil homogeneous and prevent heavier solids dropping out, operators can improve tank utilization, reduce mixing costs and maintain a uniform temperature in the tank. The Pulsair mixing system can also be installed in existing tanks and in conjunction with existing heating & steam coils. The Pulsair Oil storage tank mixers can be applicable in any type of liquid as: Slop oil, Liquid asphalt/bitumen, Heavy fuel oil (HFO), Raw crude oil, No. 6 oil, Heavy gas oil (HGO),Unconventional oil sand crude. 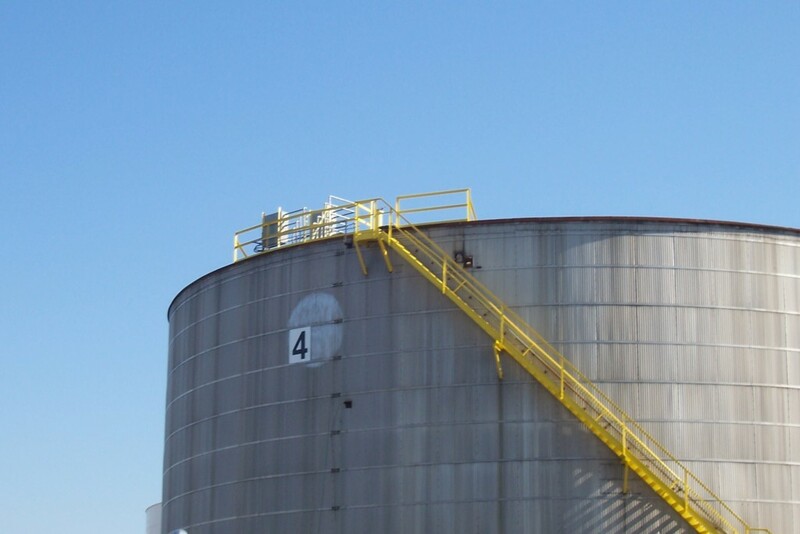 And also in any type of tank: Oil field crude storage tanks, Tanker barge, Rail tank car, Crude storage tanks at refinery, Finished product storage tanks, Marketing terminal storage tanks.